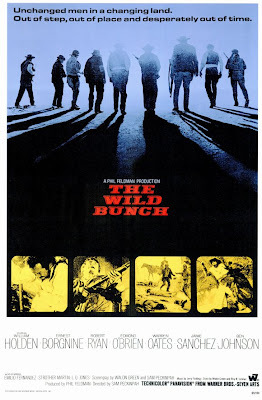 The Wild Bunch doesn’t just remain enfant terrible Sam Peckinpah’s most renowned work, it also ranks as one of the most influential and iconic Westerns ever made. The movie still has the ability to polarize its viewers courtesy its fatalistic theme, the graphic and persistent displays of carnage, and it’s disturbing yet fascinating portrayal of men living at the very edge of human civilization. Like his Pat Garrett and Billy the Kid, this too has at its forefront two former comrades who are now on the opposite sides of the law. Pike Bishop (William Holden), an infamous outlaw and the ageing leader of a gang of squabbling bounty-hunters, plans to score one last hit before he retires. His crew includes, among others, his close associate Dutch (Ernest Borgnine). Chasing Pike and his gang is Deke Thornton (Robert Ryan), an equally jaded and skilled rider. The relentlessly bleak and nihilistic film begins and ends with two of the bloodiest and most incredibly choreographed showdowns (or more aptly, massacres) that are as savage as they are unforgettable, thus forming the defining moments of the movie as well as the quintessentially American genre it belongs to. The harsh terrains, marvelously captured though brilliant camerawork, forms the perfect symbol for the brutality portrayed herein, as well as a subtle antithesis to the latent humanism that each of the principal protagonists possess. Despite the pessimistic tone and exceedingly violent content, there’s something inherently nostalgic about this extraordinarily powerful and excellently enacted movie, thus making it not just a visceral, audio-visual tour de force, but also quietly melancholic and affecting.